Whizz Education is proud to work on Project iMlango in partnership with the Department for International Development to improve educational outcomes and life chances for marginalised girls in Kenya. Thousands of girls, marginalised through poverty, will gain access to new e-learning opportunities in maths, English and life skills. 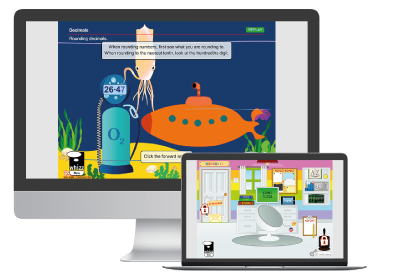 Whizz Education will be providing digital resources in maths and literacy, backed with training, to support teachers to deliver whole class lessons across 195 intervention schools within rural communities. Even more groundbreaking, each child will be individually tutored in maths within internet-enabled computer rooms, through the leading virtual maths tutor, Maths-Whizz. Performance will be monitored through Whizz’s proprietary central monitoring capability, allowing for the first time, live progress monitoring across the entire intervention, rapid feedback loops to support successful on-the-ground implementation. Thursday 17th July 2014 – The UK’s Department for International Development (DFID) has announced a groundbreaking strategic partnership with the private sector to deliver e-learning programmes in Kenya to thousands of marginalised girls. Project iMlango  is a first of its kind e-learning partnership, led by global satellite operator Avanti Communications and its partners: sQuid, the smartcard and digital payments system provider; online maths tutoring provider, Whizz Education; and technology NGO, Camara Education. The integrated programme aims to improve learning outcomes for 25,675 marginalised girls, across 195 Kenyan primary schools. Project iMlango is a strategic partnership between the Department for International Development (DFID), Avanti Communication, sQuid, Whizz Education and Camara Education. Girls who remain in education are less likely to marry as children. iMlango, derived from the Swahili word, ‘mlango’ which means doorway or portal. Families play a critical role in girls both accessing and remaining in education. Calculations based on attendance of 500-600 pupils at 195 schools.